The following is taken from THE RACING POST - The remarkable Black Caviar (Peter Moody/Luke Nolen) took her unbeaten record to 11 with the minimum of fuss under the floodlights at Moonee Valley in Melbourne on Friday night. The four-year-old darling of Australian racing recorded her latest Group 1 success with her usual panache in the William Reid Stakes, scoring eased down by almost two lengths over last year's Golden Slipper winner Crystal Lily. Hinchinbrook took third in the Aus$500,000 (about £317,000) event. After slightly missing the break on the 1-11 favourite, Luke Nolen settled Black Caviar three wide in mid-division until halfway on the tight track at Moonee Valley, home of the Cox Plate, Australasia's most prestigious weight-for-age contest. Shaken up to challenge before turning into the straight, the reigning world champion sprinter moved upsides front-running Crystal Lily, who had been handed the softest of leads. 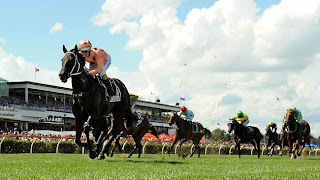 Employing her trademark acceleration two furlongs out, Black Caviar surged away from her rivals to such an extent that Nolen was able to ease her down so that she could win as she liked. "What do you say? She's just gone and done the job again - fullcredit to her, it's hard to take credit for any part of it," he said. "She's just a machine," Moody added. "I had no concerns - he probably had to wake her up as it's a bit late - she should be at home having a camp! "She's very laid back and got the job done nicely, I thought - it's great to be a part of something that's so great for racing." Nolen reported that he had had to shake her up a bit. "When I did,away she went," he said. "That's where she wins her races - in the middle stages of a race - you ride to your strengths and there aren't many horses that can live with her at this distance at weight-for-age. "The only instruction I got was not to hit her," added Nolen, who said public interest in Black Caviar's latest assignment had been "surreal". Nolen said: "I suppose Glen Bossknows what it's like with Makybe Diva. I don't know how many people are here but they are here only for one horse and we didn't want to let them down. Just to be part of it, I feel very, very privileged." While Royal Ascot officals would doubtless love to attract her to this summer's meeting, Black Caviar's connections have repeatedly dismissed the idea of her running abroad this year. She is likely to run next in the Group 1 TJ Smith Stakes at Randwick in Sydney on April 9.